How do you decide which model you need? Start with your monthly print volume. If you’re not sure what your average is, a good way to estimate it is to figure out how many reams (500 sheets) or cases (5000 sheets) of paper you go through in a month. Once we’ve narrowed down which colour or monochrome model you need to handle your print volume, we will work with you every step of the way to configure your device to suit your specific needs, from extra paper trays and finishing options, to digital enhancements like scanning to MS Word and searchable PDF formats. The bizhub C368 Series is Konica Minolta’s most popular model series. Comes with available Single Pass 100-sheet document feeder that speeds through documents at 80 originals per minute, and that’s just single sided! Double sided it scans at up to 160 opm. The large 9″ colour touch screen is intuitive, customizable, and easy to use. It is also accessible remotely by IT support staff for quick troubleshooting and help when needed. Can be customized with multiple paper tray options, 50-sheet inner or floor finishers, booklet finishers, G3 fax, and much more! Download Konica Minolta’s C368 Series brochure here. Contact us for a free print cost analysis of your current workflows, and a quote on the right MFD device for your business! The bizhub C287 Series is Konica Minolta’s entry-level colour model series. Great for low volume environments when you don’t need some of the bells and whistles of the C368 Series. Comes with a 7″ colour touch screen that is customizable, and easy to use. The available 100-sheet document feeder scans at up to 45 opm (22 opm double sided). Devices can be customized with multiple paper tray options, 50-sheet inner or floor finishers, G3 fax, and much more! The bizhub C658 Series is Konica Minolta’s mid-high volume colour model series. Great for office environments where you either have a steady flow of small jobs and you don’t want a line up of employees, or you have very large jobs you need finished quickly. The large 9″ colour touch screen is intuitive, customizable, easy to use, and accessible remotely by IT support staff for fast problem resolution. The standard 300-sheet document feeder blasts through large documents at up to 120 opm (240 opm double sided)! Devices can be customized with multiple paper tray options, 50-sheet inner or floor finishers, 100-sheets staple floor finisher, booklet finisher, G3 fax, and much more! 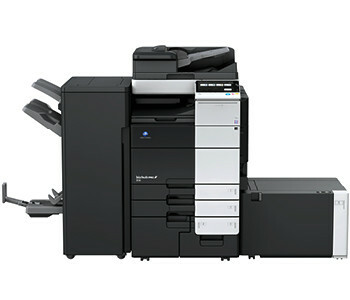 The bizhub C759 Series is Konica Minolta’s high volume office workhorse colour model series. These models are built to go all day long in the busiest of office environments, especially those that experience peaks in demand and need to speed though large documents fast! They have a solid steel frame with 4 built-in paper trays, including 2 high capacity Letter trays that hold 1000 and 1500 sheets. The large 9″ colour touch screen is intuitive, customizable, easy to use, and accessible remotely by IT support staff for fast problem resolution. The bizhub 368e Series is Konica Minolta’s best low-mid volume B&W series. Comes with available Single Pass 100-sheet document feeder that speeds through documents at 80 originals per minute in full colour (160 opm double sided). Can be customized with multiple paper tray options, 50-sheet inner or floor finishers, booklet finishers, G3 fax, and much more! The bizhub 287 Series is Konica Minolta’s award winning entry-level B&W model series. Great for low volume environments when you don’t need some of the bells and whistles available on the 368e Series, but still need reliability. Comes with a 7″ colour touch screen that is customizable, and easy to use. The available 100-sheet document feeder scans in colour at up to 45 opm (22 opm double sided). The bizhub 658 Series is Konica Minolta’s mid-high volume B&W model series. Great for office environments where you either have a steady flow of small jobs and you don’t want a line up of employees, or you have very large jobs you need finished quickly. The large 9″ colour touch screen is intuitive, customizable, easy to use, and accessible remotely by IT support staff for fast problem resolution. The standard 300-sheet document feeder blasts through large documents at up to 120 opm (240 opm double sided) in full colour! The bizhub 958 Series is Konica Minolta’s high volume workhorse B&W model series. These models are built to go all day long in the busiest of office environments, especially those that experience peaks in demand and need to speed though large documents fast! They have a solid steel frame with 4 built-in paper trays, including 2 high capacity Letter trays that hold 1000 and 1500 sheets. Visit Konica Minolta’s website for up-to-date info on their lineup of Office Multi-functions, or download their brochure.